Ohio Media Watch reports that as of this morning, WHBC AM-1480 in Canton will drop ABC Radio News for the Fox News Radio Network..While this move should surprise no one, especially since the recent passing of Paul Harvey (WHBC had carried Harvey as far back as 1951), There is sort of a sadness here. 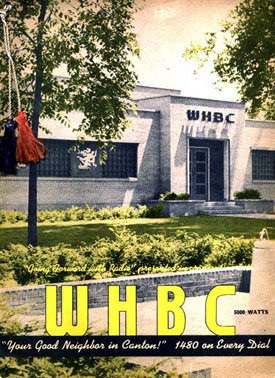 While WHBC is still a fine station and does "Full Service" as well as an station in this day and age, the dropping of ABC signals the last remnant of the "Old WHBC"..
WHBC has had affiliation with Radio Networks as far back as 1940, when they hooked up with the Mutual Network.Airing shows like Superman, Tom Mix, The Lone Ranger and many others..WHBC moved to ABC in 1947 where they carried shows like Don Mc Neill's Breakfast Club, Paul Harvey,Challenge Of The Yukon and The Green Hornet..
And many others..Since 2008, WHBC has stopped playing music, going to a News/Talk/Sports format with full-service elements-Some local talk, though not as much as Id like..However, they do a better job at "Full Service" than many stations do today..Even with what they do today, the one link to the old days was ABC Radio..And that is gone..
An Interesting piece on the History of ABC Radio-With the old (pre-1968) ABC Radio Musical bridge from their newscasts and the announcement:"This Is The ABC Radio Network"
Note:I wanted to include more here, including an ABC Newscast pre 1968-At least the "sounder" as well as The Theme for the American Entertainment Network post-1968..I have a little of the "old WHBC" on some Broadcast HOF CDs I might try to add here or in a new post.If anyone has old audio as I describe above, I would appreciate it..Thanks for any help.. Does any body know anything at all about WHBC's one-time parent, The Canton Repository, having once applied for a TV station in Canton. As far as I know from reading Repository microfilm from the early 1950's..Brush Moore Newspapers, owners of the Rep and WHBC ,competed with Stark Broadcasting, owners of WCMW-1060 for UHF Channel 29..The FCC awarded Channel 29 to Stark Broadcasting, which went as far as having an office at 324 Market Avenue North and the call letters WTLC, but never made it on the air.. I rather suspect that 29 never got on the air because the successful licencee had to spend so much money competing with Brush Moore in trying to get the license. I would like to ask a question , for someone that works at W.H.B.C , I bought some auction things in it was 8 drinking glasses , on this glass was an Eagle Logo , with W.H.B.C on it 1968 in RED , then under that is white letting with Hawks / Falcons / Sparrows / I don't know if this has anything thing related to this place or not . I have no direct involvement with WHBC other than being a longtime listener/blogger, based on what you say, my guess is it would have nothing to do with the radio station, but maybe with a bowling league?..If you want to send the picture to me my email is tlones1@neo.rr.com..I don't think anyone of the current WHBC staff would know what it is..